How many emails did Bill Clinton send during his 8 years as President? 1971: Ray Tomlinson, a computer engineer working for Bolt Beranek and Newman in Cambridge, Massachusetts, developed a system for sending messages between computers that used the @ symbol to identify addresses. He now can’t remember the first message he sent, or the exact date he sent it. Tomlinson’s system gained popularity by linking up users on Arpanet, the US Department of defense system that became the basis for the internet. 1976: Queen Elizabeth II sends an email message on Arpanet, becoming the first head of state to do so. 1989: The first release of Lotus Notes email software. 35,000 copies are sold in the first year. 1997: About 10 million users world wide have free web mail accounts. 2001: Email celebrates its 30th anniversary with virtually every business in the developed world signed on. Nowadays, the average working American will send around 40 e-mails every day. It’s how we communicate, advertise, and in general receive a bulk of our information. With that said, let’s step back briefly into the 1990s when the first major commercial Internet Service Providers such as AOL, Prodigy, and CompuServe all hit the scene. These are the guys who would just give users an email address automatically, and it wasn’t until the late 1990s when services like Hotmail disrupted the industry. While all of this was happening, our country was being run by President Bill Clinton who served from January 20, 1993 – January 20, 2001. Given the sensitivity around his wife’s email practices, this number is that much more fascinating. 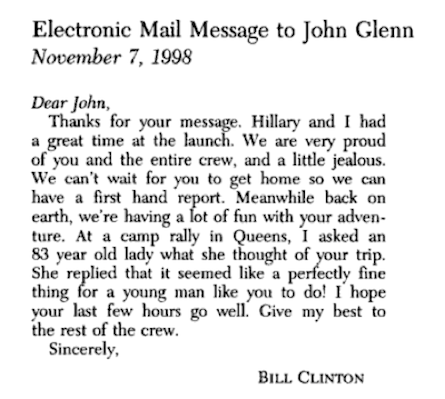 Here is the email he sent to John Glenn on November 7, 1998. Previous Previous post: Who has a bigger population: California or Canada? Next Next post: Has a woman ever been awarded the Medal of Honor?